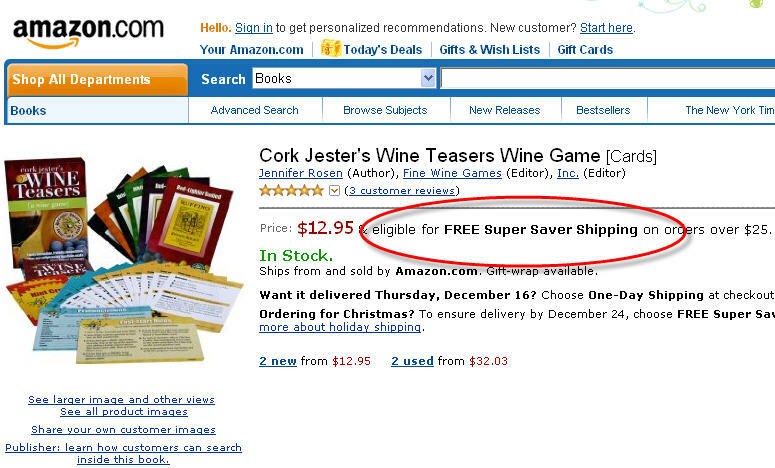 There’s still time to qualify for FREE Super Saver Shipping on Wine Teasers wine game at Amazon.com. Just follow this link: Wine Teasers at Amazon.com. At $12.95 there’s no better stocking stuffer related to wine! Read more about it at the Wine Teasers website, then go to Amazon.com to make your purchase with free shipping (according to Amazon.com’s $25 purchase rules). The folks at Chicago’s Strongbox Wine Cellar have posted a nice, short review of Cork Jester’s Wine Teasers wine game. We agree! Head over to Amazon.com and grab a copy of Wine Teasers today!